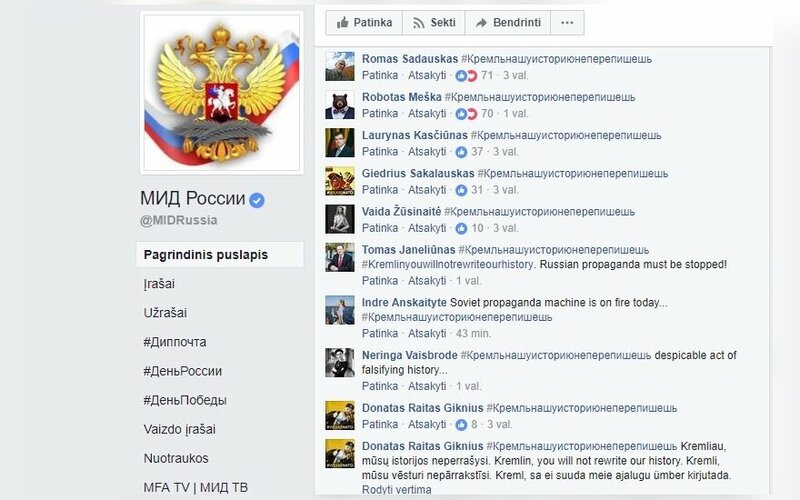 After thousands of Lithuanians responded on Facebook to the Moscow attempts to spread propaganda on post-war guerrilla in three Baltic states, Lithuania's Foreign Minister Linas Linkevičius said that the Russian attempts to interpret history was a constant phenomenon, adding that the civil initiatives on social networks were very important. "Interpretations of history is one of the ways of Russian propaganda, this happens all the time, and we feel intensification from the Russian side. Of course, we must respond to these things, especially since we have something to say (....). This is an ongoing process, and it is a good thing that it is not only the institutions that respond, the civil initiatives are also very important, possibly even more important than the administration telling to do or organize something," Linkevičius told BNS on Sunday. On Friday, the Russian Foreign Ministry published a message on Facebook about Lithuanian residents allegedly murdered by post-war guerrilla. At the invitation of Lithuanian journalist Andrius Tapinas, more than a dozen of thousands of Lithuanians left a hashtag message #Кремльнашуисториюнеперепишешь (Kremlin, You Can't Rewrite Our History) on the Russian ministry's Facebook wall. 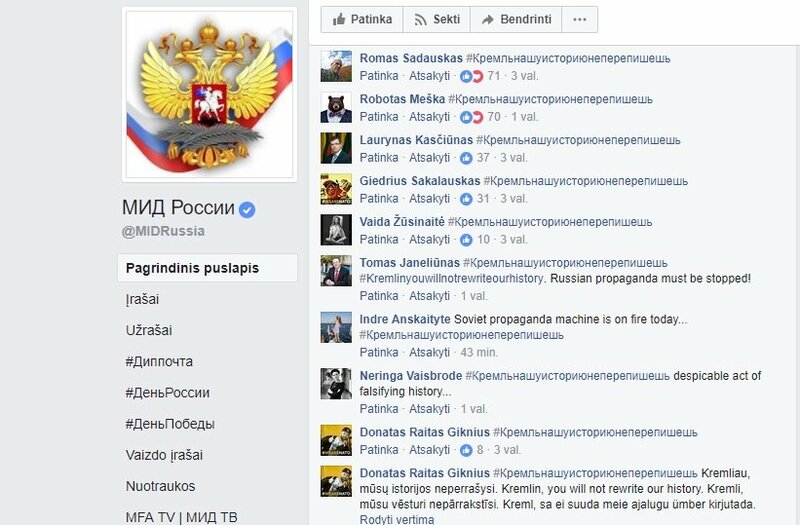 Tapinas also called upon Lithuanians to rate the Russian Foreign Ministry's Facebook website – its ratings fell from 4 to 1. The misleading Russian messages appeared after NATO last week published a video about Baltic guerrilla - "brothers of the forest" who opposed the Soviet rule. "This can be a response to this, a pretext and a determination to once again discredit the NATO efforts to boost their presence in the region. Let's not forget that NATO stepped up its presence, exercises are taking place, weaponry is used – the process should be compromised in any way possible. This is one of the ways of doing this – depicting NATO as an organization supporting fascists, as they are trying to say here. To put it mildly, it is strongly not true, however, this can be used and interpreted this way," said Linkevičius. He emphasized that the ministry had also responded to the latest Russian propaganda.